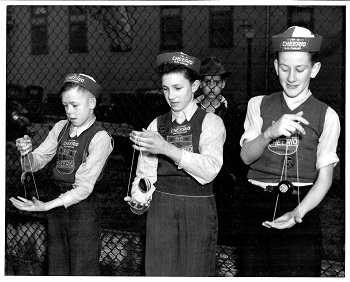 A photograph of three young boys somewhere in Canada, each sporting a variety of Cheerio patches sewn onto their award sweater vests, and wearing "I'm a Cheerio Yo-Yo Champ" hats. Circa late 1930s to early 1940s. -Cheerio 99 Champion shield patch. -Cheerio 99 Silver Award round patch. -Cheerio 99 Bronze Award round patch.